Note: The Bluehost $2.95/m deal doesn’t always show. Here’s how to make it show up! Bluehost deals on their front page are for 36 month renewals – 3 years. Need to make a decision fast? Click below for the maximum discount today. This price is for a 3 year subscription. Bluehost doesn’t offer coupons as such. The above table contains all the deals at the moment, and they include a free domain as well! Here are some common questions people have about Bluehost. There’s a special $2.95/month plan for 3 years and above. However, it doesn’t always show immediately. Here’s how to make it appear. Remember that this Bluehost special offer is for 3 year or 36 month subscriptions only! It’s not surprising that the greatest savings come when you commit to a longer time period. However, I feel that these can be misleading because other providers like SiteGround display prices for one year renewals. Click on the plan you want, and you’ll be asked to enter a new domain name, or that of an existing one. After you wait a while, a link will appear on the bottom allowing you to skip this step entirely. 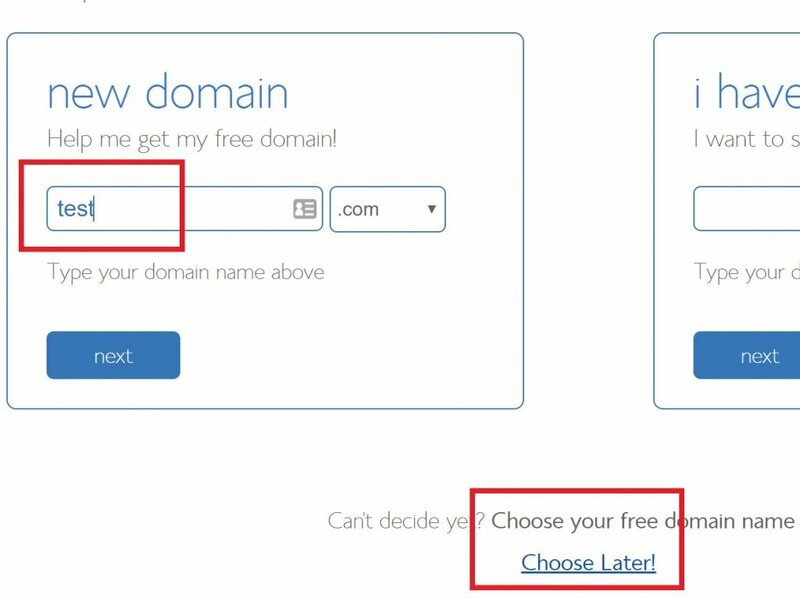 Keep in mind that all Bluehost coupons in 2019 include a free domain as well for the first year. It’s not a separate coupon code. So it’s a good time to make use of that offer! The next screen is where the full cost of what you’re paying for is revealed. When you scroll down, you’ll see that the drop down box is automatically set to a 36 month period along with the discounted price you’ll be paying. If you want a lower subscription period, then make the selection, but remember! The discounts will drop. 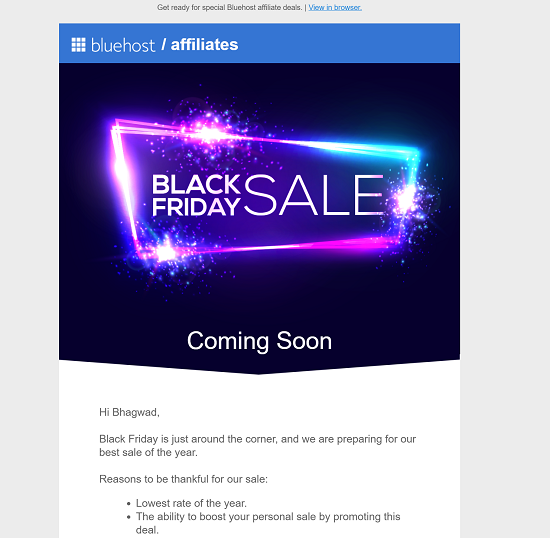 Bluehost Coupon Code 2018: Any Changes in 2019? 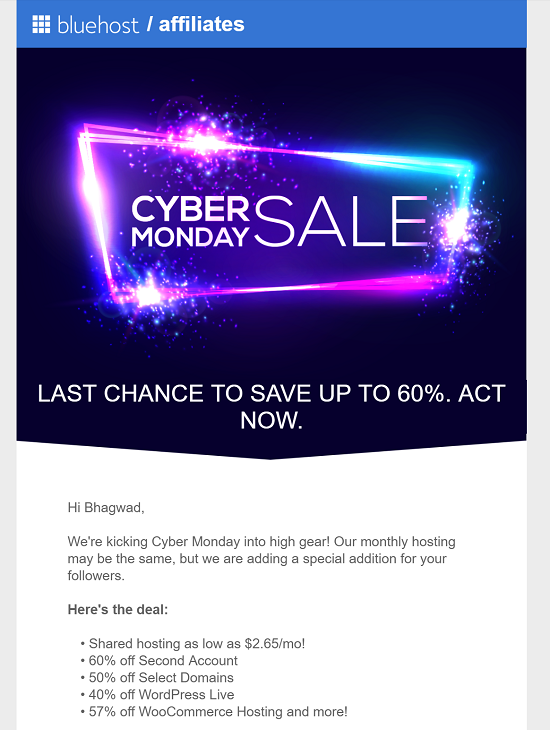 Bluehost has very standardized discounts. Once in a while on unique events, it actives the special offer for $2.95/Mo. And once a year we get the super low offers on Black Friday and Cyber Monday. Sometimes however, the special deal doesn’t show up. Here’s how to maximize your chances of seeing the $2.95/Mo deal. Bluehost 90% Off Coupon: It Doesn’t Exist! There are a lot of people searching for a 90% off coupon code from Bluehost. I don’t know how this idea got started, but it’s a hoax. There is no Bluehost 90% off coupon. 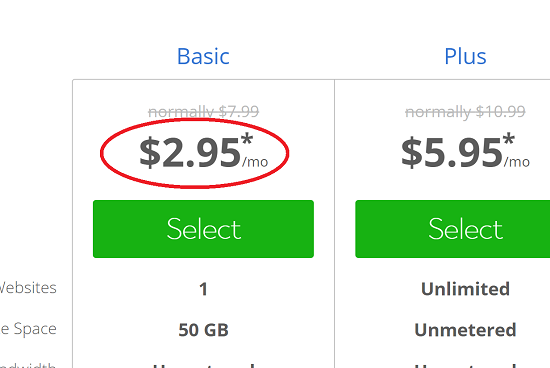 The maximum discount you’re going to get is 63%, and it’s for the “Basic” shared hosting plan. Sites which offer you higher discounts, just want you to click on their links, and they use misleading information in the headings, so they can get credit for any eventual sale you make – even if it’s not with the discount that you clicked for. Maximum Bluehost Coupon 2019 Savings? Unlike other web hosts, Bluehost allows you to purchase up to a maximum of 60 months – that’s 5 years. Hosts like SiteGround and Hostgator have a limit of 36 months or three years. So any Bluehost coupons that you apply increase in savings if you purchase for a longer billing cycle. If you’re looking to save the most money in absolute terms, you should choose the longest billing cycle of 60 months. 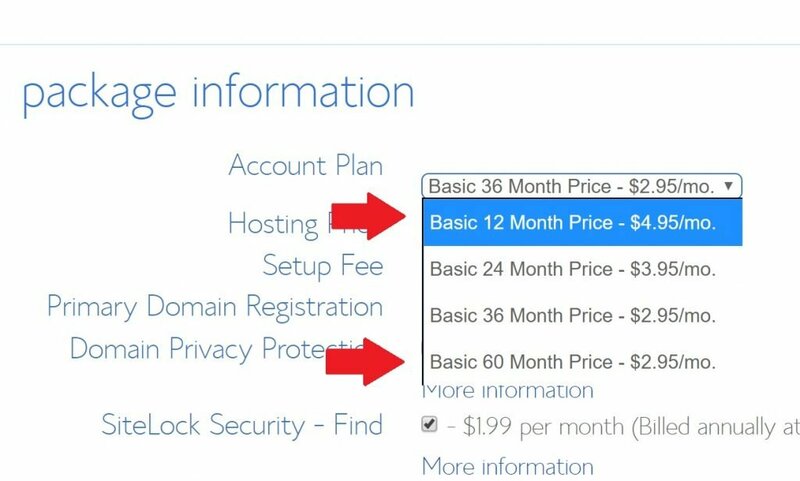 The difference between the 12-month and 60-month Bluehost discounts can be huge. So not only do you have lower “per month” costs with a longer billing cycle, you also get the lower prices for a greater period of time, leading to massive savings. Note how their plus and prime plans seem to have the same cost. Are There Bluehost Renewal Coupons? No. There is no Bluehost renewal price discount. The discounts you see on this page, are applicable only to the first billing cycle – you choose how long that is. It ranges from one month, to 60 months (5 years). The discount will apply each month for as long as the cycle lasts. After that, you pay the full price for each hosting plan. This means that you get the maximum dollar value of the discount if you choose the longest billing cycle. Of course, it means that you pay more for it up front, but you save the most in the long term. You have to manually transfer all your files, settings, and programs. Depending on your technical skill level, this might be quite daunting! Where Do I Enter Bluehost Discount Codes? Unlike other providers like Hostgator, the Bluehost coupon 2019 deals are implicit for various offers. There’s simply no space to enter them anywhere. The discounts are applied automatically once you click the links above. One notable benefit is the inclusion of a free domain with the Bluehost special offer. Other providers like SiteGround, and A2 Hosting charge extra for domain registration along with hosting. So the Bluehost specials have an edge in that regard. It’s something to remember if you’re doing a Bluehost vs GoDaddy comparison. Bluehost Coupon 2019: Monthly Options? Yes. When you sign up, you can choose to be billed monthly, without any commitments. Keep in mind however, that you lose all discounts! The Bluehost month to month prices are the most expensive, and I wouldn’t recommend it to anyone unless you just want to try out the service for one month. Instead, find host for a 3 or 5 year period using one of the options from the Bluehost deals list. 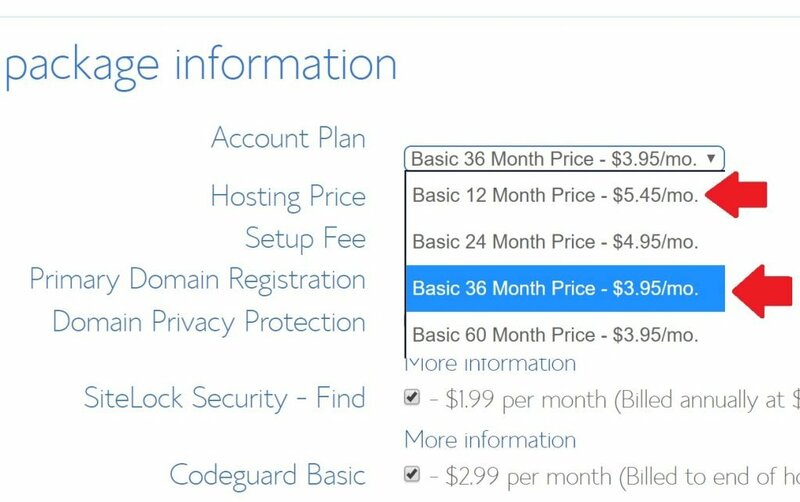 On special occasions, Bluehost reduces the price even below their usual $2.95/month. Here’s the affiliate e-mail I received for this Black Friday’s deal. It’s the lowest price of the year at $2.65/m. As you can see, the price drops to $2.65/month and 60% off the second account. If you can get the $2.95/m deal from Bluehost with a free domain, it’s one of the best prices you’ll see anywhere on the market. A lot of hosting providers have low prices, but they make you pay buy a domain for the first year. There are plenty of great Hostgator coupon codes but no free domain. This raises the effective price of hosting for the first billing cycle, and should factor into your calculations if you’re searching for the best hosting deal. Here’s a summary of the various Bluehost plans. Shared hosting means your website lives on a server with lots of other accounts? How many? No one can be sure. Sometimes dozens, and a few unscrupulous hosts even stack hundreds of sites one upon the other, in an effort to drive down costs. Bluehost has been accused of doing this in the past as well. If you purchase higher tier Bluehost plans, the server density decreases, and you get more resources for your site. This means faster page speed loads, and a more responsive site. The Bluehost “Pro” plan in particular has extremely low density server. So you have limits placed on disk usage, MySQL database usage, Email accounts etc. The screenshot above shows one of the higher tier plans, so lower level packages will have much more stringent restrictions. The Bluehost coupon 2019 code that you use to obtain discounts doesn’t affect the plan capacity in any way. The shared hosting plans all come with a free domain name, making Bluehost one of the most cost-effective web hosting services around – especially if you snag their $2.95/Mo offer. Unlike Hostgator for example, the basic plans allows you to park domains, so this is a good, cheap plan if you want to trade in web properties. For a long time, Bluehost offered only professionally managed WordPress hosting. This was far more expensive than their regular web hosting. In fact, it was more expensive than most other WordPress plans offered by other web hosts. You can see why in the link. The last feature is really useful when you want to test out changes on your site before making them live. You can set up a test or “staging” environment, to see how your site responds to the new settings. If everything goes well, you can “push” the changes to the live site. It’s similar to SiteGround staging. But other than the above features, the Bluehost WordPress plan is the same as regular web hosting in every respect. In fact, the “WP Pro” plan was the only WordPress plan that Bluehost offered for a long time. Then in order to compete with other web hosting providers, they introduced the regular WordPress hosting package, which is nothing but souped up shared hosting. Anyone who’s run a successful website knows that beyond a point, shared hosting just won’t cut it. Your server won’t be able to handle the load, you’ll lose out on customers, and eventually Google will penalize you in the SERPS. With Bluehost managed WordPress hosting, you can put those concerns to rest forever. Your site will be able to handle the most demanding incoming traffic scenarios – you basically pay for what you get. WP Pro hosting also comes with several features that you would normally have to pay for anyway. Like a CDN and Dynamic caching. Even though my personal opinion is that Cloudflare is the best CDN, I can’t deny the value of a dedicated CDN service. Not only that, you also get dynamic server side caching. This means you don’t need to rely on 3rd party plugins like W3 Total Cache, W3 Super Cacher and WP Rocket Cache to save static copies of your pages and serve them to visitors. Instead, it all happens automatically in the background. This further insulates your site from traffic spikes, and vastly improves the response and page load times. Here’s complete list of web hosts that offer caching on shared hosting plans. Perhaps the most remarkable feature about the Bluehost managed WordPress plan is the inclusion of the premium and professional Jetpack service with the “Grow” and “Scale” plans respectively. It’s excellent value for money when you consider that the “Professional” Jetpack service is itself $30/m! To have that included in the price of a managed WordPress solution is pretty amazing. 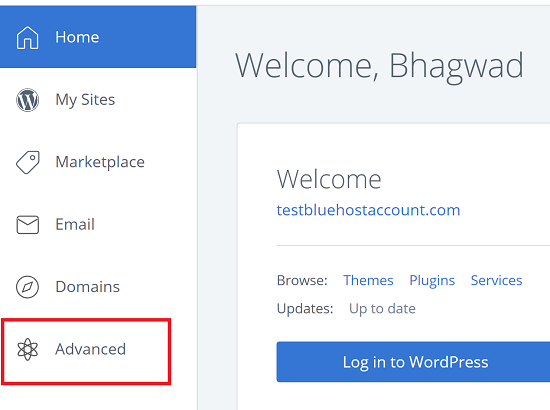 So if your site runs solely on WordPress and you find that you’re getting more visitors than you can handle, I suggest you take a close look at the Bluehost managed WordPress hosting packages. You’re going to have to upgrade sooner or later anyway, so why not start early and get ahead of the curve? If you need more power than what even the “pro” shared hosting plan can give you, then Bluehost VPS will fit the bill. This is a “Virtual Private Server”, which means that you get dedicated resources that are not shared with anyone else. In addition, all these VPS plans come with Bluehost’s SSD drive technology. This means faster read/write speeds, especially on dynamic applications like WordPress. Since a VPS server is like a separate machine, you get full root access with WHM and cPanel. WHM is the standardized server side management software, where you can configure all aspects of your VPS, including users, accounts, security, DNS clusters, and more. So even though it’s a “managed” solution, you still get root access to the VPS plan. What’s more, you can expand the resources available to your VPS once you’ve purchased it. This means your server can grow or shrink according to your needs on the fly, and you don’t need to change your plan to do it. Bluehost has specialized hosting for eCommerce websites, called “Bluehost eCommerce”. It’s essentially WordPress hosting with a bunch of additional things that make it ideal for eCommerce. There’s a special Bluehost coupon 2019 offer for WooCommerce in the above list. However, if you really want specialized eCommerce hosting, then you should go with Liquid Web’s WooCommerce package. Liquid Web is more expensive, but it’s the real deal. Bluehost’s package is good, yes. But it’s nothing compared to the sheer optimization and speed of Liquid Web’s WooCommerce setup. Most WordPress websites have heavy dynamic caching. This means that they take copies of pages that don’t change and show them to users. The end result is that the server doesn’t need to generate pages from scratch for each user. This results in faster speeds, less server load, and a good experience for everyone involved. However, eCommerce sites have a unique problem when each customer’s page looks different. Perhaps you have “related products” on the page, or there’s a shopping cart with the customer’s items. For these reasons, WooCommerce websites are very demanding on the server. In addition, the WooCommerce plans have a higher disk capacity along with the trademark Bluehost SSD drives that everyone likes. However, it just ends up redirecting to the regular Bluehost shared hosting page. So while there are several articles on the Bluehost site about the differences between shared and cloud hosting, it’s now a moot point. So why did Bluehost get rid of cloud hosting? The reason is that cloud hosting is more and more coming to be associated with VPS hosting instead of shared hosting. But the two are not the same. Here’s a beginner’s explanation of the differences between cloud and shared hosting. And here are the cons. At one time, Bluehost used to show the CPU usage of its hosting plans. However, that option no longer exists. But they will still suspend your account if you use too much. Unfortunately, they’re not very clear about what “too much” means. 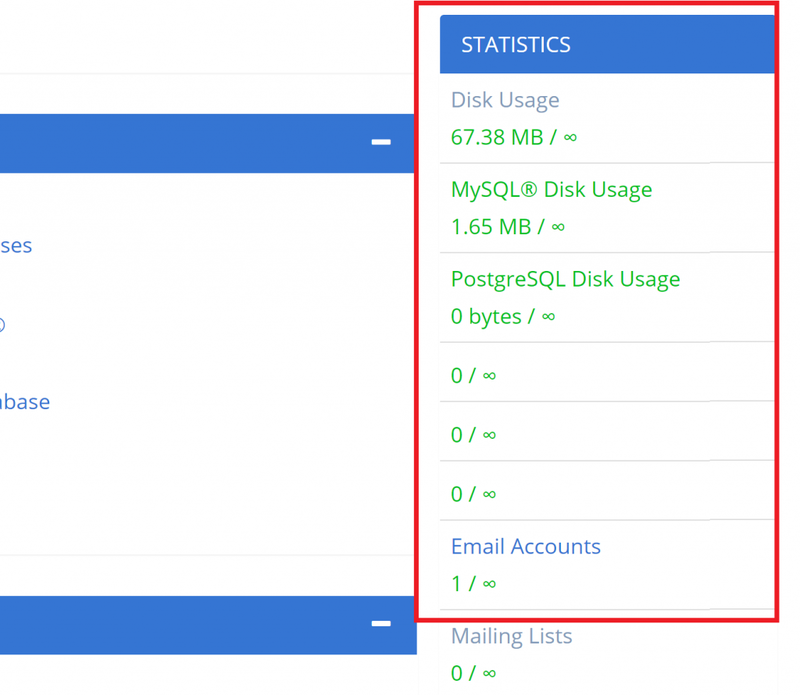 I’ve written a more detailed post on Bluehost limitations where you can see how to check the bandwidth, disk usage, and other resources like MySQL databases, email accounts etc. Bluehost CodeGuard: Is it Worth it? This comes as an add-on to the Bluehost plans, and you can purchase it during checkout along with options like domain privacy. CodeGuard is a service that’s meant to back up your site and restore it in case something goes wrong. But in my opinion, the Bluehost CodeGuard Basic plan is not worth it. You only get 1 GB for 5 sites, and there’s no on-demand backup. If this is something you need however, here’s a list of free alternatives to CodeGuard. Should You Enable Bluehost Domain Privacy? During checkout, a Bluehost coupon 2019 discount includes a bunch of add-ons that you may not want such as domain privacy which prevents your name from showing up on the public WHOIS registrar. The Bluehost promo code list above doesn’t include one for domain privacy. If you disable this option, you’ll get a scary popup warning you that your contact details are not private. This is true. On the other hand, most website owner’s contact details are available on WHOIS. It might even give your site more credibility. If you look up the WHOIS information for all major sites, the web owner contact information is public. That’s because it looks good to have some transparency about who you are instead of hiding behind a veil of secrecy. You don’t have to provide your primary email address, but you can use the one for your business. Basically, the same information you likely already have on your website! Other addons like SiteLock and so-called “SEO packages” are also offered. I don’t know about SiteLock, but I suggest you stay away from anyone service like this charging you for SEO. You can probably do it yourself, and do it better. Does Bluehost Use cPanel for Administration? Last year, Bluehost revamped their entire control panel. The philosophy behind the design was to move the most common functions to the very front of the screen, and hide the lesser used links at the end, so as to not confuse those who are new the hosting experience. From here, you can access all the cPanel functionality that you were used to! Also, the new cPanel interface has a “search” button which you can use for all the regular cPanel functions as usual. 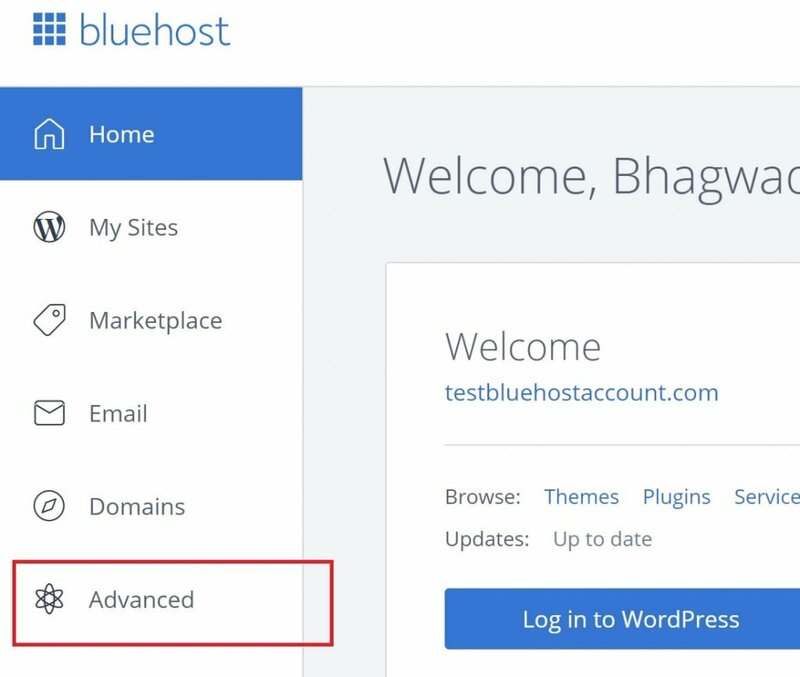 Bluehost pricing is influenced by the fact that they are one of the few hosting sites that are explicitly recommended by WordPress. 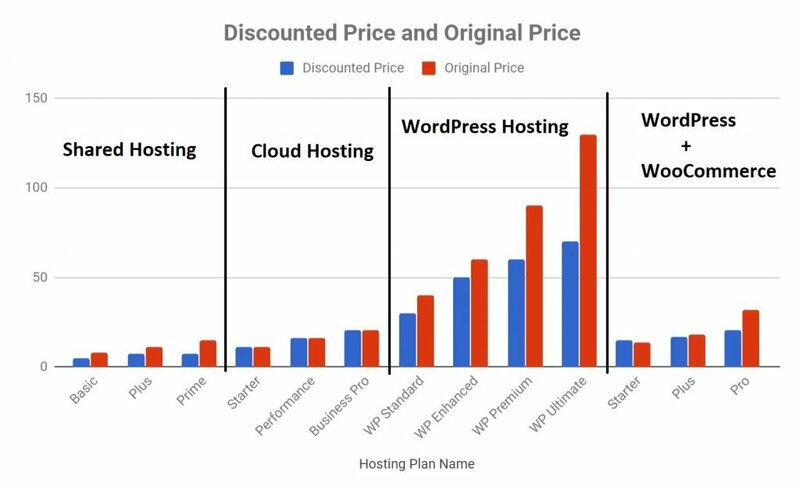 So even though you can get good discounts on their WordPress hosting, it’s still a lot more expensive. Does BlueHost Allow SSH Access? Compared to how it was before, BlueHost now allows all users to access SSH functionality without having to specifically send a message to customer service. They probably realized that users won’t be happy if they need to jump through hoops to access this service. Finally, you can directly start generating key pairs straight out of the box. So this is a great time to snag one of the Bluehost coupon 2019 deals, since SSH access is no longer a problem! Luckily for us, Bluehost started offering free SSL via Let’s Encrypt in June 2018. So there’s no need for Bluehost coupon codes for SSL anymore. With the new focus on SSL certificates and HTTPS by Google, having a security certificate is more important than ever. Bluehost uses AutoSSL to install and renew free Let’s Encrypt certificates. Normally, these expire every 90 days, but Bluehost does this automatically for you. These price have been calculated after applying the highest Bluehost coupon 2019 discount. What’s interesting, is that their “WordPress + WooCommerce” plan is a lot cheaper than their standard WordPress plans! These come with WooCommerce installed, as well as an SSL certificate and a dedicated IP. So if you want to use WordPress as a backend for a regular store, then you might as well purchase the WooCommerce package instead of traditional WordPress if it’s too expensive for you. 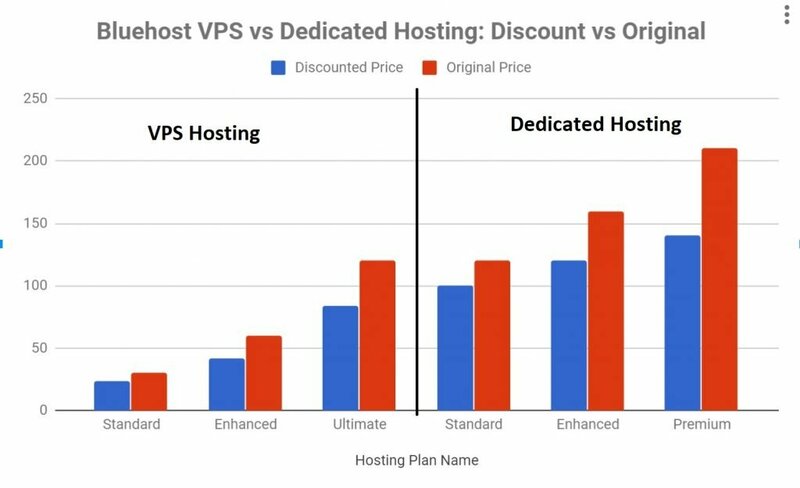 You can see that the top tier of VPS hosting costs the same as the lowest tier of dedicated hosting without the Bluehost coupon 2019 price! So if you’re thinking of purchasing the 3rd level VPS from Bluehost, you might as well choose to buy the dedicated server instead. To summarize, with the right Bluehost coupon in 2019, you can get some of the cheapest shared hosting on the market. The real benefit is that Bluehost also offers free domain along with hosting – and with the low price of $2.95/Mo, that’s really a great deal. The only one that truly competes with Bluehost in terms of savings is Hostgator – and they don’t offer a free domain. So Bluehost is really where it’s at. They’ve been in the business for a long time and are doing well. So they must be doing something right! Finally FREE SSL with Bluehost! Why is Bluehost Managed WordPress so Expensive?